McKee's 37 Wheel Special combines some of our best wheel maintenance products. For a limited time, clean and protect your wheels for less with this special collection of McKee's 37 products! This detailing season is the perfect time to start cleaning and protecting your wheels the right way – with the McKee's 37 Wheel Special! Your vehicle’s wheels are a big part of its value, especially if you have alloy, chrome, or aluminum wheels. Wheels of all kinds are susceptible to brake dust corrosion, water spotting, and contamination. Shield your wheels from rain, pollen, road grime, and of course, brake dust with the McKee's 37 Wheel Special. This kit combines some of our best wheel maintenance products. Start with McKee's 37 Foaming Gel Wheel Cleaner to safely remove brake dust, dirt, and oil from your wheels. Then apply McKee's 37 Wheel Glaze for a lasting, slick layer of protection. These products are compatible with any type of wheels and they’re water-based. The Green Medium Flex Foam Finger Pockets and Polyfoam Wax Applicator are great tools for applying wheel protection between spokes. You’ll love what the McKee's 37 Wheel Special can do for your wheels. McKee's 37 Wheel Glaze is a cleaner and a polymer sealant that blocks out dirt and brake dust with a shiny protective coating. Cleaning agents remove dirt, brake dust, tar, sap, and bugs while improving fine scratches. 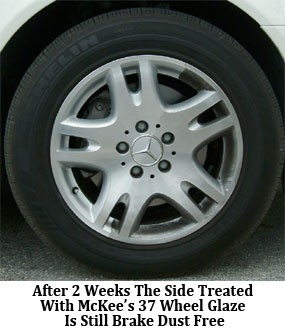 McKee's 37 Wheel Glaze creates an anti-static finish that inhibits brake dust and keeps wheels cleaner. The best way to apply wax is with a closed cell soft poly-foam applicator. Foam Wax Applicators will apply wax evenly without creating swirl marks or scratches. Applicators can be washed and used again and again. Green Medium Flex Foam Finger Pockets are the easiest way to clean or polish tight places. These foam pockets fit over three or four fingers so you can maneuver in small spots. The foam has light cutting power so it’s perfect for polishing metal components. Finger Pockets allow you to reach between the slats in your vehicle’s grill or between spokes. The foam is more absorbent than a towel so it’s great for product application. Take advantage of this offer while it lasts! The McKee's 37 Wheel Special is a great value on excellent products. Start the season off right with a clean set of wheels courtesy of McKee's 37! A total retail value of $54.97. You SAVE $14.98! I'd give this kit 5 stars if the wheel cleaner worked better. It really doesn't seem to have much more effect than a normal soap wash. The other components are excellent though. The finger pockets really are great for application of the wheel glaze. The wheel glaze does make a difference in reducing wheel grim although it's not as dramatic as the pictures on the product page; but it's definitely easier to wash/clean the grime off after they've been properly glazed. I bought this kit and have been nothing short of impressed. The wheel cleaner works great and is farely gently. The finger pockets make wheel glaze application easy. And the DP Wheel Glaze is the best wax I've ever used on my wheels. I have black Cobra R rims on my Stang and it made them look and feel better than new. Plus they really stay clean. Something I've had a hard time dealing with on my mustang.